View More In Cereal - Page 7. Our oatmeal organic probiotic baby cereal is perfect for babies ready to move beyond rice cereal. It is enriched with DHA and Choline for Baby's brain and eye development and contains probiotics to support digestive system health. 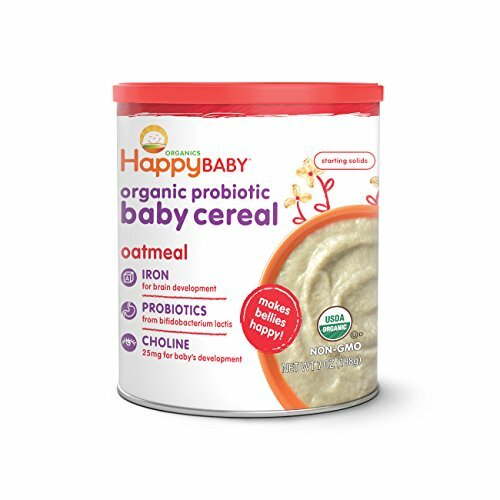 BABY'S FIRST SOLID FOOD: Our oatmeal organic probiotic baby cereal is perfect for baby's first solid food. This organic, probiotic baby food is enriched with Iron & Choline for Baby's development & contains probiotics. A great part of a healthy breakfast. ORGANIC PROBIOTIC BABY CEREALS mix with breast milk, formula or water & are the perfect way to introduce solid foods & new textures. Once baby is ready, mix our baby cereal with Simple Combo purees to introduce new tastes that are gentle on baby's belly.